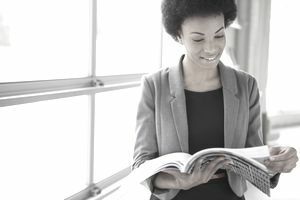 A trade publication is a term for a specific kind of publication — usually a magazine, journal or newspaper — that is geared to people who work in a specific business or industry. Unlike a consumer publication, a trade publication covers a specific topic for people who work in that particular field or industry and therefore cover an industry in more minute details than a consumer publication might. The idea is that trade publications deliver information that's of value to those who work in a certain field, but might not be of as much interest to the general public. Trade magazines are often exclusive as they are not sold at retail chains and are usually circulated to an elite class of subscribers and members interested in the publication's particular industry. For example, someone who likes movies might read a consumer publication like Entertainment Weekly because it covers entertainment. But someone who works in the movie industry will probably be reading publications like Variety and The Hollywood Reporter, two trades that cover deals and other things happening in Hollywood more closely. Most articles found in trade publication are not particularly long — 2-3 pages in length is the norm — and since they are written for the professionals in the field they don't offer explanations of basic concepts as they assume the reader knows the basic concepts of the industry. Interviews with successful industry leaders. These types of articles allow readers to learn who did what, when, how, and why from others in their industry, and get ideas that they can then apply to their own business ventures. Frequently Asked Questions and customer inquiries. Readers want to also learn about the best and most efficient way to do what needs to be done, as fast as possible, for their customers. These types of articles help teach better customer service and lead to more sales down the road for the reader. "List" articles. Articles written in a list format are always reader favorites. Whether it be the top 10 ways to sell a particular item, to a list of must-have products, lists can pack a lot of punch in a small article. Trade publications are often written in the language of the profession, by business or industry representatives and sometimes even by freelance writers. Aside from citing "industry sources," it can often be very difficult to tell who wrote the articles as some trade publication articles are anonymously written.